After breakfast, you will transfer to Amesbury, the oldest occupied settlement in the United Kingdom (since 8820 BC). Upon arrival in Amesbury, you will visit Stonehenge with your group. 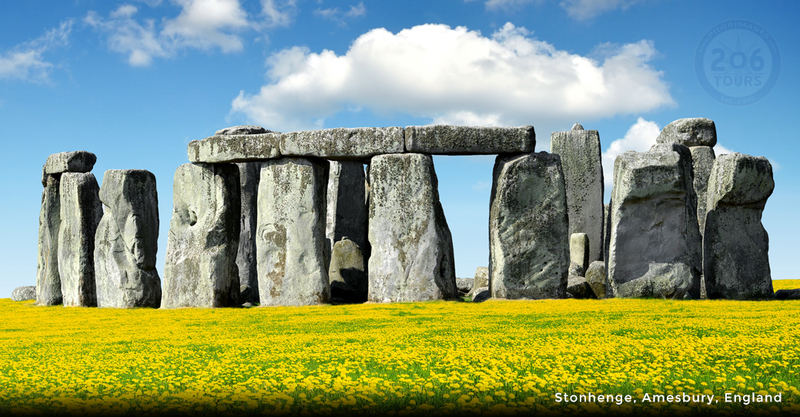 Stonehenge is one of the biggest wonders of the world and most known pre-historic monument in all of Europe. This monument dates back to the Neolithic age. Throughout your tour, you will have the opportunity to see the resources, tools, and objects which have purposefully led the lives of those in the Neolithic age. Following the tour, you will enjoy lunch on own. 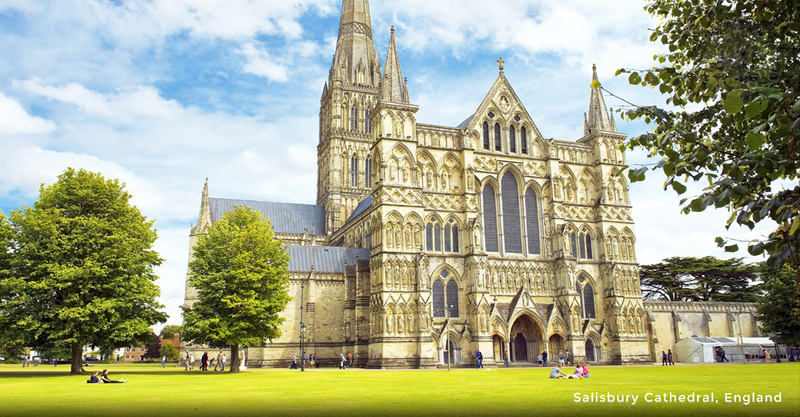 Following lunch, your group will board the bus and head to the city in countryside, Salisbury. The first stop in Salisbury is at the Salisbury Cathedral which includes, the Chapter House. The Chapter House holds the best four preserved manuscripts from the Magna Carta, which guaranteed basic liberties in 1215. You will be able to witness the beautiful scenes of the stories of Genesis and Exodus which encircle the interior of the Chapter House. These stories include, Adam and Eve, Noah, the Tower of Babel, and Abraham, Isaac and Jacob. Your group will enjoy private Mass and visit St. Osmund's, a church dedicated to the patron saint of mental illness. Following this visit, you will board the bus for Southampton, considered to be a major port on the south coast of England. You will enjoy dinner and overnight at your hotel. Following full breakfast at your hotel, you will transfer to Glastonbury, a small town in Somerset, England. This town shows evidence of inhabitants which date back to the Neolithic times. Currently, it is considered a New Age community that holds many beliefs concerning Joseph of Arimathea, who donated his own prepared tomb for the burial of Jesus after the crucifixion. Upon arrival, you will proceed to the Glastonbury Abbey for a guided tour. The Glastonbury Abbey, due to the Saxons and later the Normans was regarded as the richest monastery in 1086. Unfortunately, as a result of the Dissolution of Monasteries, this Abbey was among many of which was sold off to lay occupiers. 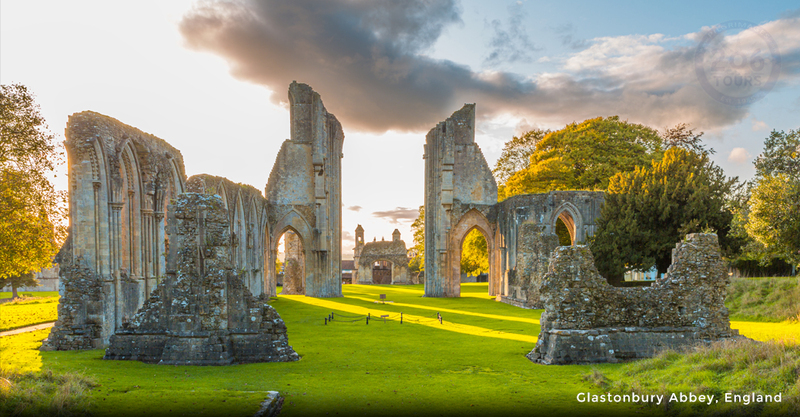 While at the Glastonbury Abbey, you will have the opportunity to wander through the beautiful 36 acre park grounds, visit the burial place of King Arthur, see the Holy Thorn which is said to have been the staff carried by Joseph of Arimathea. This Holy Thorn is said to be a descendant of the original tree, which flowers around Easter and Christmas. Following the tour, you will enjoy lunch on own. After lunch, you will transfer to the city of Bath where you will enjoy a half-day sightseeing city tour and Mass. Your group will visit the Benedictine monastery, Downside Abbey, also known as, The Abbey of St. Gregory the Great. The Downside Abbey was completed right after World War I and holds the relic of Ireland's, St. Oliver Plunkett, who remained a faithful Catholic in the face of English persecution. While at the Abbey, you will have the opportunity to view the Lady Chapel, which is the most complete piece of this beautiful church. Also in this chapel, there is a reliquary that contains the skull of St. Thomas of Cantilupe. Following Mass, you will transfer to your hotel for dinner and overnight. 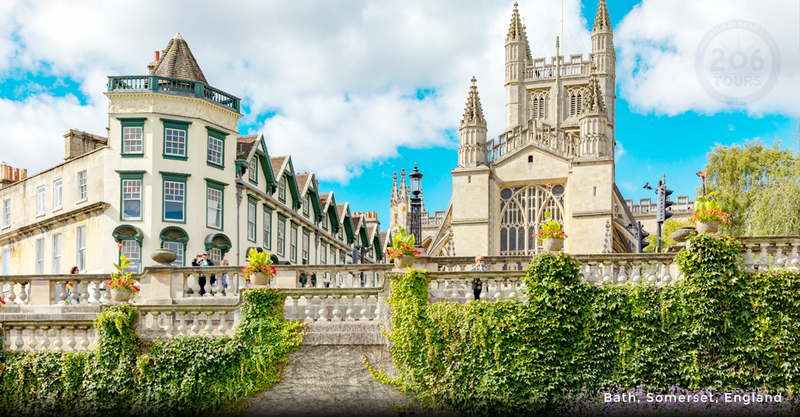 Today, following breakfast at your hotel, you will spend some time in the ancient city of Bath. Tradition tells us that this city was founded based on its hot springs with steaming water, although historically, it became a spa in AD 60 when the Romans built baths and a temple. 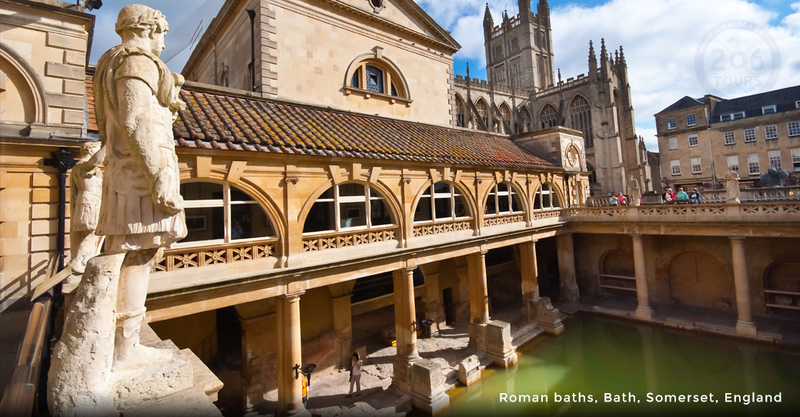 In Bath, your group will enjoy a city tour which includes the Roman Baths Museum. During your visit to the museum, you will have the opportunity to explore the remains of the ancient heated and changing rooms, in addition to the tepid and plunge pools. After the Roman Baths Museum visit, you will attend Mass and visit St. John the Evangelist's Church. It was built by the Benedictines of Downside Abbey, and officially consecrated in October 1863. It is dedicated to St. John the Evangelist, writer of the Gospel. 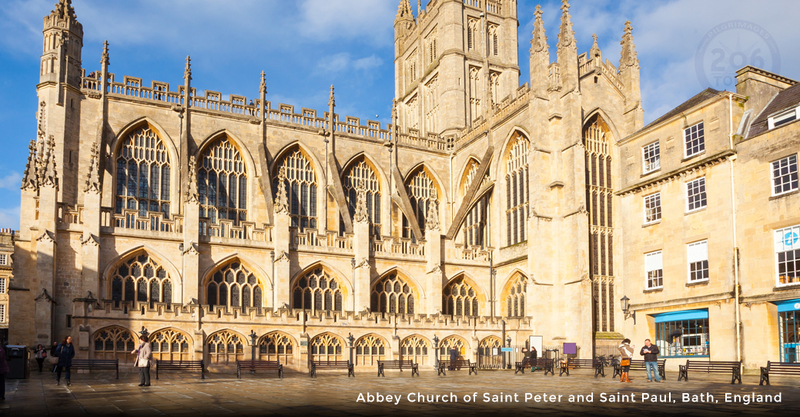 The city of Bath sees St. John as an oasis of peace in the midst of their busy city. Following this visit, your group will transfer to Birmingham, with a stop in Stratford upon Avon. In Stratford upon Avon, your group will enjoy lunch on own and a city tour which will include the birthplace of English poet and playwright, William Shakespeare. Not only will you be able to experience Shakespeare's early life but also, experience the thoughts of famous writers such as Charles Dickens, John Keats, Walter Scott and Thomas Scott who also visited Shakespeare's home. 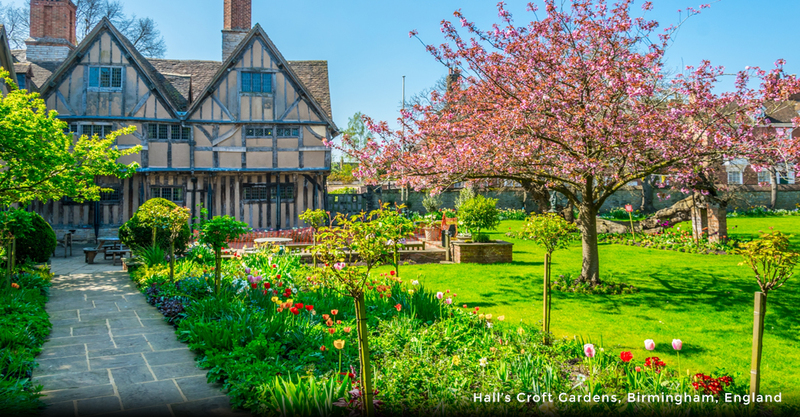 On your tour, you will be able to see Hall's Croft, Harvard House, Shakespeare's birthplace and his grave. Following your tour, you will continue on to the metropolitan borough of Birmingham, known for its prominence in the 18th century as it was responsible for numerous scientific, technological and economical advancements following the Industrial Revolution. Today, this city is known as a major international commercial center. 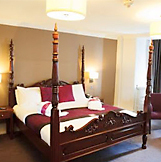 Enjoy dinner and overnight at your hotel. 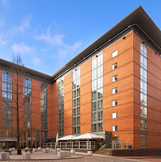 In Birmingham, you will enjoy a city tour following your hotel breakfast. The city tour begins at St. Philip's Cathedral. This Anglican cathedral designed by Thomas Archer, models Baroque style architecture. It was built in the early 18th century just as the industrious advancements were being made in the city of Birmingham. The tour continues, and you will enjoy a visit to the Oratory Church, followed by private Mass. 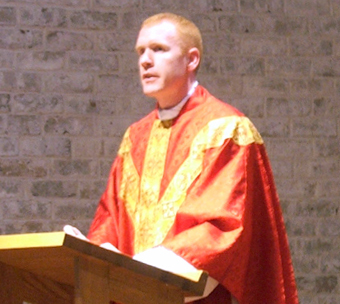 This English Catholic religious community is part of the Congregation of the Oratory of St. Philip Neri. This congregation began by St. Philip Neri in Florence in an attempt to keep his group of men out of trouble. They focused on spiritual reading, moral discussions, pilgrimages to churches and convents, and visits to the sick and dying. However, this group was brought to England by way of two former Anglicans, John Henry Newman and Frederick William Faber by their admiration that they felt for St. Philip Neri. This Oratory was also visited by Pope Benedict XVI, after the beatification of John Henry Newman. After your visit to the Birmingham Oratory, your group will enjoy lunch on own and board the bus to London. Upon arrival, you will visit St. Etheldreda's Church in Ely Place. This church is the oldest Catholic Church in England and served as a safe haven for Catholics who continued to celebrate the Mass despite the Catholic persecution in the 17th century. At this church you will find the shrine to St. Etheldreda, an incorrupt saint, who lived a life of austerity and saved many through her powerful intercessions from Heaven. 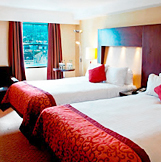 After the visit, you will attend Mass and return to the hotel for dinner and overnight. 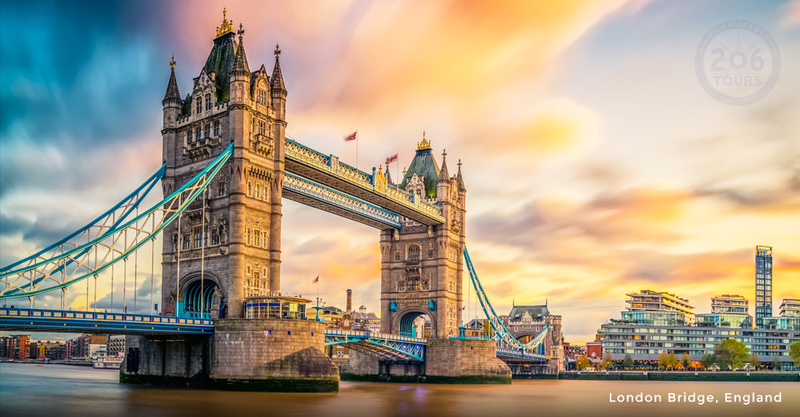 Following a full breakfast at the hotel, you will explore the magnificent city of London by enjoying a full day sightseeing tour. Your tour will begin at one of the world's great churches. 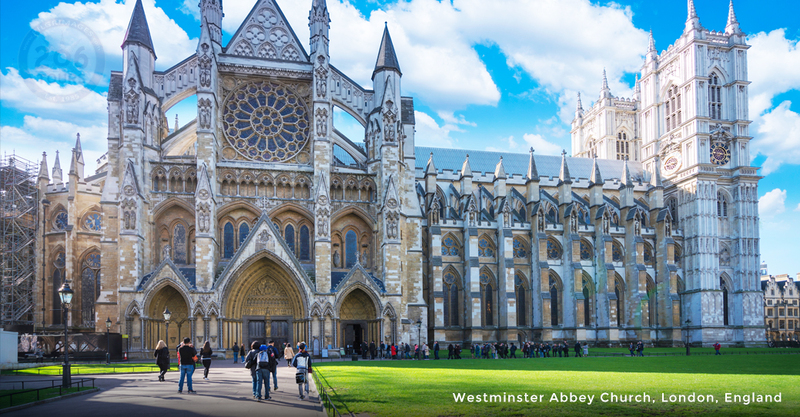 Inspired by Gothic architecture, the Westminster Abbey contains numerous paintings, stained glass, pavements, textiles and artefacts. The Abbey is also the resting place to many monarchs and therefore is held as one of the most momentous locations in the United Kingdom. 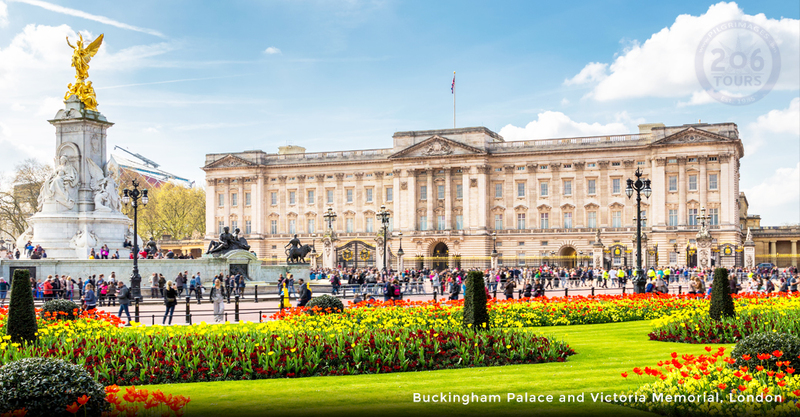 The tour will continue to Buckingham Palace, bought by George III in 1761 for his wife Queen Charlotte, but did not receive a sovereign resident until Queen Victoria in 1837. Over time, the structure transformed from a house into a palace, undergoing numerous renovations. 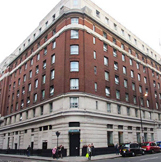 Today, it is the official residence and administrative headquarters of the British Monarch. 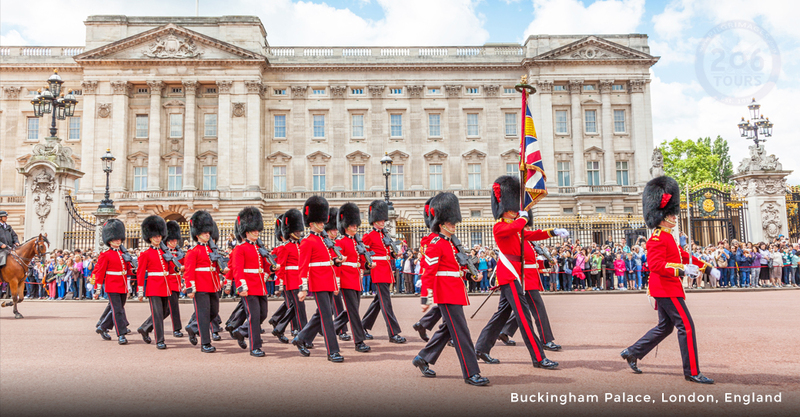 Outside of the palace, you will become entranced by the immaculate precision of the drill and band during the Changing of the Guard. Following this event, your group will have some free time to eat lunch on your own before attending a private Mass. 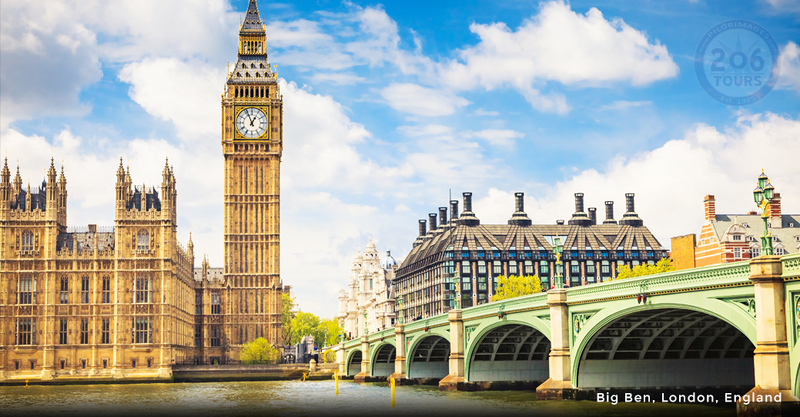 Following Mass, you will visit the ever famous, Westminster Abbey. Following Mass, you will visit the Anglican cathedral dedicated to the great spreader of the Gospel, Paul the apostle. 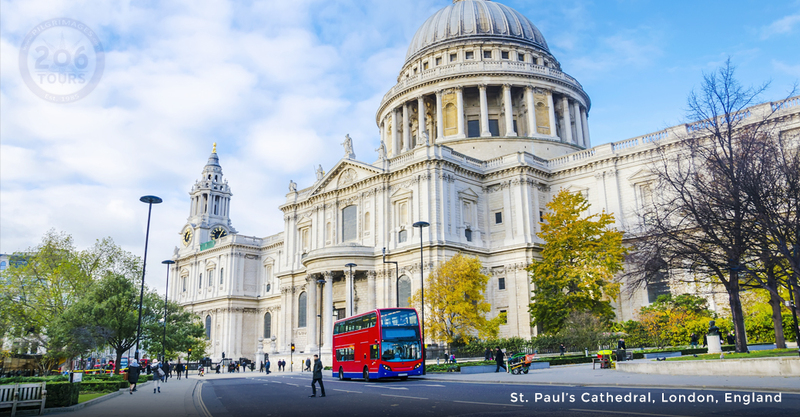 St. Paul's Cathedral is the highest point in the City of London, and was reconstructed after the Great Fire of London (1666). Experience the crypt in the lower level of the Cathedral where is the resting place of many noteworthy figures such as, Lord Nelson, Arthur Wellesley (First Duke of Wellington), and architect of St. Paul's, Sir Christopher Wren. 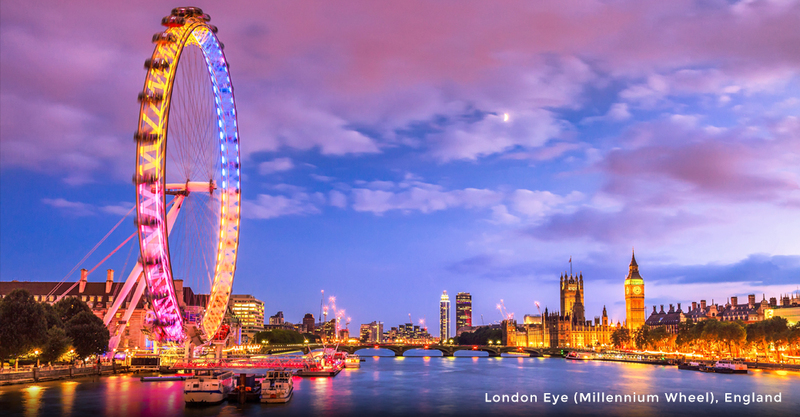 See the numerous chapels and monuments constructed in memory of the notable of England. 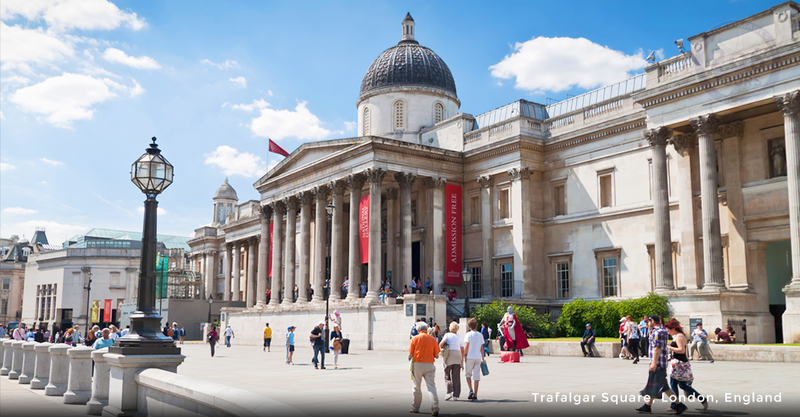 The last component of your tour will include Piccadilly Square, Regent Street, and Trafalgar Square. Piccadilly Square is considered the "Times Square" of London, where tons of locals and tourists congregate to enjoy all of the shopping and entertainment that London has to offer. It is a roundabout that centers the five major streets in the city of London, one of which is Regent Street. Regent Street is one of the major shopping streets in the West End of London and is known for its urban design. 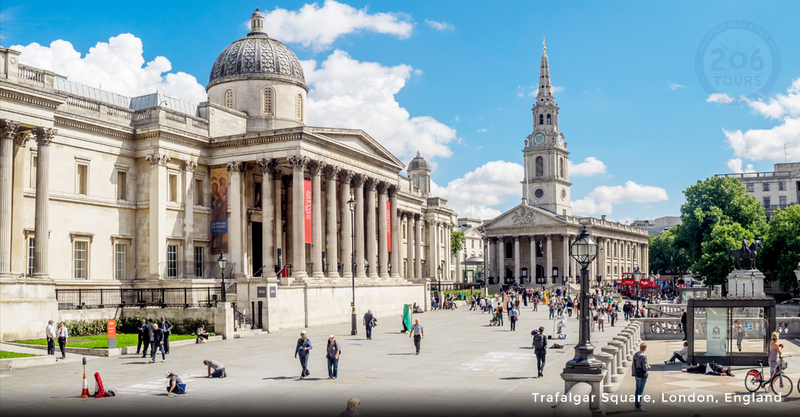 Also, you will experience Trafalagar Square, the spirited open space where Londoner's enjoy St. Patrick's Day, New Year's Eve and other celebrations. This square is also home to many political demonstrations and sports event gatherings. Lastly, after the fun-filled, busy day, you will proceed to your hotel for dinner and overnight. This morning, after breakfast you will depart for a full day excursion to Cambridge and Walsingham. 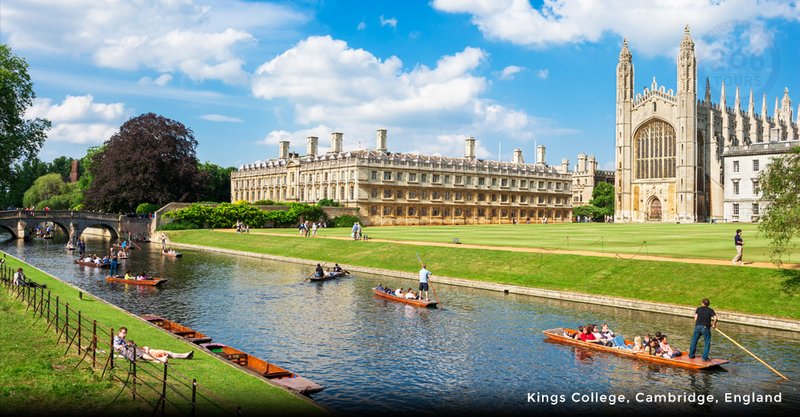 In Cambridge, you will visit Kings College, founded by King Henry VI in 1441. The college chapel is noteworthy for being the greatest example of Gothic architecture, and their chapel's choir is world renown. Following the visit to the college, you will have lunch as per your own arrangement and after, the tour continues to Walsingham. At Walsingham, you will see the Roman Catholic National Shrine of Our Lady of Walsingham which was established in 1061. According to the text of the Pynson Ballad, after much prayer, Our Lady led Richeldis de Faverches to Nazareth and saw the house where the Annunciation occurred. Faverches felt Our Lady's call to replicate the house in the town of Walsingham. Your group will attend private Mass and visit the Slipper Chapel (on premises of the shrine). The Slipper Chapel is dedicated to Saint Catherine of Alexandria, patron saint of pilgrims to the Holy Land. This chapel is of importance to the Catholic faith because it was used as a poor house after the Reformation. 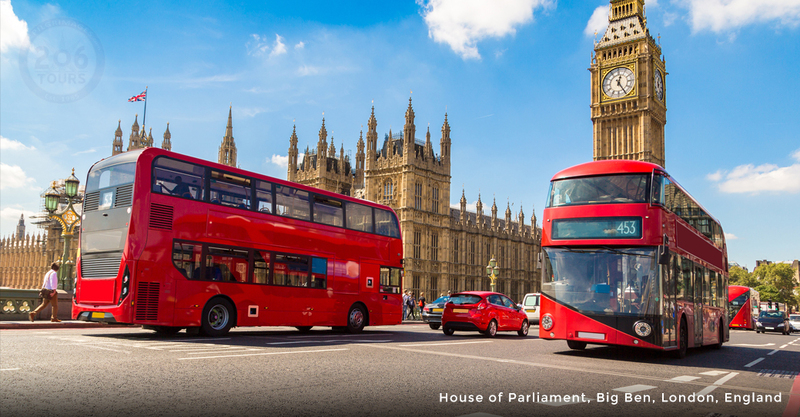 Your day will culminate as you board the bus and head back to London for dinner and overnight at your hotel.